For analysts of the Chinese economy, questions about the accuracy of the country’s official GDP data are a frequent source of angst, leading many to seek guidance from alternative indicators. These non-official gauges often suggest Beijing’s growth figures are exaggerated, but that conclusion is not supported by our analysis, which draws upon satellite measurements of the intensity of China’s nighttime light emissions – a good proxy for GDP growth that is presumably not subject to whatever measurement errors may affect the country’s official economic statistics. Li’s metric – since dubbed the ‘Li Keqiang index’ – has declined for four of the past six years, recording an especially precipitous drop in 2015. Such signals have prompted many observers to believe the Chinese economy is weaker than official statistics portray it to be (notwithstanding the fact that the index rose over the course of 2016). Sceptical of the official numbers, many Wall Street analysts have constructed their own models of Chinese economic growth, combining elements of the Li Keqiang index with statistics on retail sales, construction, and other types of activity. Many of these measures suggested that Chinese economic growth in the last quarter of 2015 was indeed much lower than the official rate of 6.8% - with the ‘true’ figure often claimed to be less than 5%, or even below 3%. These non-official indices are all based on assumptions about and models of the Chinese economy that are difficult to express, let alone test. Each model implies a particular set of weightings for a particular set of economic indicators, and changing these parameters would have profound implications. 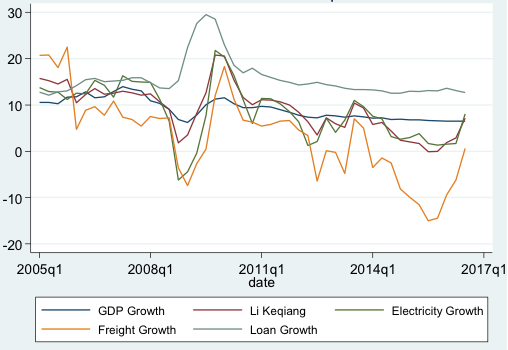 As Figure 1 shows, the components of the Li Keqiang index – the growth rates of electricity production, rail freight, and bank loans – have followed separate trajectories over the past 12 years. Placing greater weight on any of these inputs would produce a much different stream of GDP growth estimates. We see that the growth rate of bank loans has been very stable over time, hovering around 12-13% year over year, except during the financial crisis of 2008 and its immediate aftermath. Meanwhile, the rail freight growth series has shown a sustained decline over the past 12 years, reaching a low point in December 2015. This precipitous deceleration was one reason that market participants a year ago were so concerned that official statistics were not reflecting the true state of the Chinese economy. However, there are more innocuous explanations for the decline of rail freight growth, such as the structural transition of the Chinese economy from heavy industry toward services. In light of the structural changes under way in the Chinese economy, we might devise a modified Li Keqiang index, placing more weight on the bank loans series than on the rail freight series (instead of weighting the three growth rate series equally). This approach would have sparked much less cause for concern at the end of 2015. But what weightings would be statistically sound? And, more fundamentally, how can we tell what the best set of weightings would be? To resolve these issues, we need to develop a transparent, data-driven procedure centred on an independent gauge of Chinese economic growth – one whose measurement error is unrelated to those associated with the components of the Li Keqiang index. We argue that such an independent measure exists in the form of satellite-recorded data on the brightness of nighttime lights across Chinese provinces over time (Ghosh et al. 2010). It has been well established that growth in nighttime light intensity is a good proxy for economic growth (Henderson et al. 2012, Pinkovskiy and Sala-i-Martin 2016). By gauging how well changes in different economic variables correlate to fluctuations in nighttime light intensity, we can see which series are more reliable as growth indicators. The task of measuring the relationship between nighttime light intensity and true unobserved economic output is complicated by weather and atmospheric disturbances, both of which affect how light is captured by orbiting satellites. These errors are plausibly unrelated to those that dog conventional statistical measures, which are subject to systematic reporting errors by people and businesses, mistaken decisions by statistical agencies, or, in some cases, outright manipulation by government officials or economic actors. Hence, nighttime lights are useful as an ‘independent referee’ to determine the quality of conventional statistical series. The heart of our analysis – as detailed in our recent paper (Clark et al. 2017) – is a regression of growth in nighttime lights across Chinese provinces and over time on the growth rates of the various statistical series used to calculate the Li Keqiang index and the various indices devised by Wall Street analysts. Under our key assumption – that measurement errors in nighttime lights are independent of the measurement errors of the other variables utilised – the regression coefficients we obtain on the statistical series are proportional to the optimal weights that should be applied to these measures in order to derive predictions for true Chinese GDP growth. This hypothesis holds for a variety of possible interrelationships between true GDP growth and nighttime lights growth. 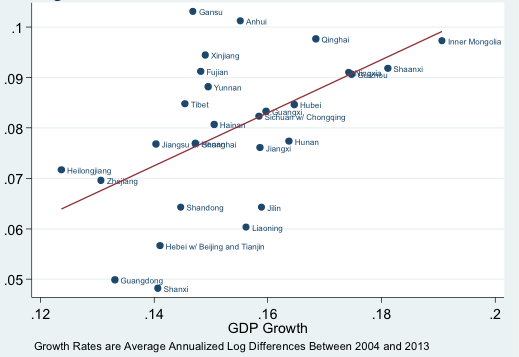 In particular, as long as true GDP growth and nighttime lights growth are correlated, we can allow this correlation to change over time or vary across different areas of China. The correlation between official GDP growth and nighttime lights growth is documented in Figure 2. Our regression also includes flexible factors that absorb any nationwide changes in nighttime light intensity (or economic growth). For example, if Chinese lighting technology changed during the time period of our analysis, leading to a proportional brightening of all Chinese lights, the weightings we derive for the components of our new GDP growth proxy would not be affected. We find that the components of the Li Keqiang index should not be assigned equal weighting, as is typically supposed. In fact, our analysis indicates that bank loan growth should be given six to eight times more weight than rail freight growth, with the optimal weighting on electricity production growth somewhere in between. Under additional assumptions (specifically, if we normalise our proxy to match the level and trend of official Chinese GDP growth before 2012), the implications of this reweighting on our optimal estimate of Chinese GDP growth are profound. We find that since 2012, our estimate of Chinese GDP growth was never appreciably lower, and was in many years higher, than the GDP growth rate reported in the official statistics. Adding other series besides those incorporated in the Li Keqiang index does not change our results. 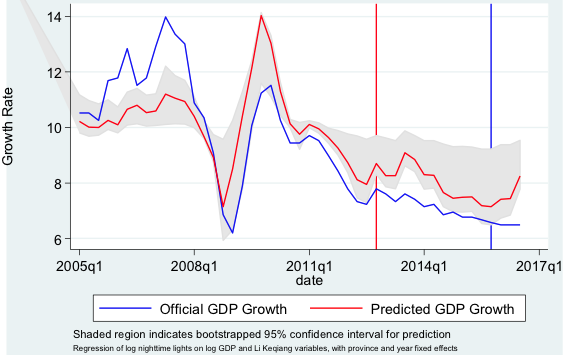 Figure 3 presents the path of official Chinese GDP growth alongside our modified Li Keqiang index (with the weights determined by the nighttime lights regression). We place a 95% confidence interval around our prediction. Looking back at the prediction for the end of 2015, we can reject the dire growth-collapse scenarios that were suggested by some of the Wall Street indices at the time, with it being very unlikely that the true growth rate of China was much below 6%. On the contrary, while we generally can’t reject that the official growth estimates are correct, we also can’t reject that they have understated Chinese growth since 2012, with the true level being closer to the average seen in the 2005-12 period. Our results are consistent with work by Rosen and Bao (2015), who argue that Chinese statistical services have chronically underestimated the size of the service sector. Rosen and Bao’s hypothesis is consistent with our finding that rail freight growth should receive less weight than the other indicators in the Li Keqiang index. Hence, as the Chinese economy becomes increasingly service-oriented, the (conventional) Li Keqiang index will likely send increasingly faulty signals about the state of China’s economy. In fact, our estimate for Chinese growth shows an appreciable acceleration in 2016, even as the official growth rate remained virtually unchanged. It is important to understand the limitations of our analysis. While we present evidence that China’s growth was not as weak as claimed by some analysts in 2015 and is not experiencing a sharp slowdown right now, we have no way of saying whether the current pace of growth will be sustainable far into the future. The fact that bank loan growth appears to have been such a durable predictor of China’s overall economic growth raises some cause for concern (Dawson et al. 2017). Should lending decline for some reason – if, for example, the assumptions underlying existing lending are found to be unwarranted – then the Chinese economy could experience considerable turmoil. Rather than dismissing such risks, our research simply indicates that, at present, there are few immediate indications that Chinese growth is being systematically overestimated. Editors’ note: This column first appeared in the Federal Reserve Bank of New York’s Liberty Street Economics blog under the title ‘Is Chinese Growth Overstated?’ and is reprinted here with the Bank’s permission. The views expressed in this column are those of the authors and do not necessarily reflect the position of the Federal Reserve Bank of New York or the Federal Reserve System. Clark, H, M Pinkovskiy and X Sala-i-Martin (2017), “China’s GDP Growth May Be Understated”, NBER Working Paper No. 23323. Ghosh, T, R L Powell, C D Elvidge, K E Baugh, P C Sutton and S Anderson (2010), “Shedding Light on the Global Distribution of Economic Activity”, The Open Geography Journal 3: 148–161. Henderson, J V, A Storeygard and D N Weil, (2012), “Measuring Economic Growth from Outer Space”, American Economic Review 102: 994–1028. Pinkovskiy, M and X Sala-i-Martin (2016), “Lights, Camera, Income! Illuminating the National Accounts-Household Surveys Debate”, Quarterly Journal of Economics 131: 579–631. Rosen, D H and B Bao (2015), Broken Abacus? A More Accurate Gauge of China’s Economy. CSIS Report.